The command line listed below will also launch the IIS MSC. Select the Web Site to configure. If server side includes are configured when IIS is setup, the file extension types .shtm and .shtml are configured in IIS to parse and process any #include statements. 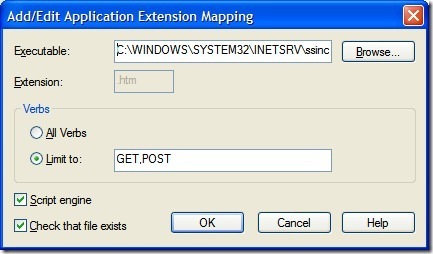 This same extension mapping needs to be completed for .htm and .html file types. Perform the same steps for .html files. 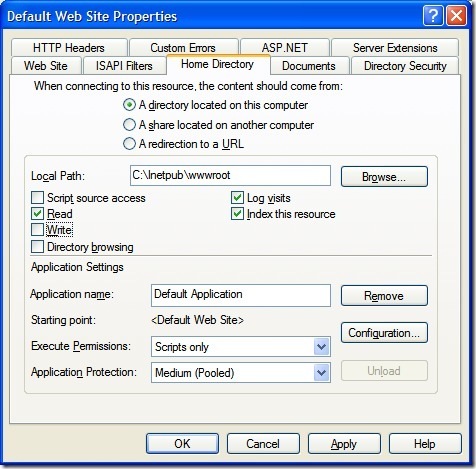 The configuration changes described here apply to both IIS 6 on Windows XP and Windows 2003 Server. Turning on .htm processing slows down IIS to some degree so if you are including large files you may want to evaluate the impact to performance. File types for .SHTM and .SHTML are more industry standard for include processing, but the Windows XP, Office and Visual Studio systems do not come configured by default to have Open / Edit handlers from the file system so I prefer the .htm extension for include processing. I often use a naming convention "Include.Name.inc.htm" to help clearly indicate this file is a file included from other .htm files. Visual studio will complain with validation errors that these HTML snippets or included files are not a valid HTML or XHTML document (which they are not, they are only snippets to be included into other files). ASP and ASP.NET could file types could be used for #include processing as well. However in my experience, if the only goal is managing #include processing and no other server side logic needs to be performed, it is much faster to have .htm #include processing and to not incur the overhead of ASP.NET compiling the application each time it gets removed from the application pool. I know there are strategies to deal with making ASP.NET 2.0 sites "pre-compiled" and to place them into application pools other than the default application pool, but I believe that is emphasizing the point I'm trying to make. Why add additional overhead in deployment headaches if it's not really necessary. If you are hosting with an external hosting services, most web hosting providers either allow you to configure your hosting environment to turn on #include processing, or they will do it under a change or support request. Lastly, using #include processing on a site gives one a little more flexibility in moving from a Windows hosted server to a Linux / Unix based or Apache server if needed. 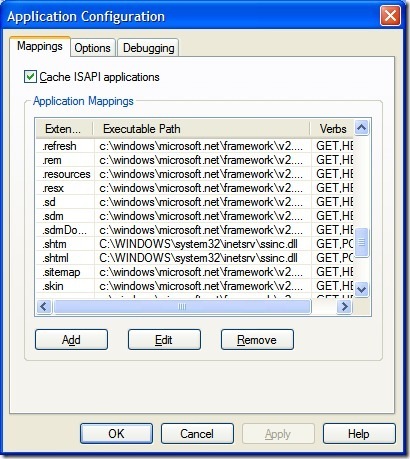 While for the most part ASP and ASP.NET based #include processing schemes require a Windows host.